Creature of Habit: Paris Baguette for breakfast! Navigating for the KTX train from Seoul Station is easy because of all the signs. Solo traveling? Make sure to keep your eyes wide open! Before I go on with my Day 3 post, I have something I really want to talk about in this blog. Even before the issue that my friend in blogging, David, brought up on his Instagram stories where someone said that they only went to India to take pictures, I've always wanted to explore this topic. First of all, "traveling for the 'gram" by definition is taking loads of well-curated, well-directed pictures to post on one's Instagram account. Is it really wrong to travel for the 'gram? And are we (bloggers / social media peeps) really just traveling to take these pictures? I was able to bring up this issue to my younger sister last night, when she's driving on our way home. I really wanted to get her side since she's the type who will tell me her thoughts as is--kahit masakit or not in favor of me. Actually, my sisters are the ones who give me the balance that sometimes I don't see with my work and lifestyle, and they will be honest to me--not to harm me--but for my sake. Her reply is: "Bakit masama ba yun? Hindi naman ibig sabihin nag pho-photos e hindi sila nag enjoy a? Ako din naman panay ang photos nung Taiwan namin." Nagulat ako! This is coming from someone na walang pake sa Instagram followers and feed, at naka private ang profile! Narealize ko na even during the times of my parents when they travel, they already take lots of pictures to print for their photo albums. My sister added, "Ako gusto ko ng madaming pictures kasi gumagawa padin ako ng scrapbook." Nagkataon lang siguro na ANG GANDA ng photos nila David during that trip na nag mumukhang wala na sila ginawa kundi mag picture picture, but in fact, what do we know? That's just like 5 Instagram photos posted in a day, showing us maybe not even 1/4 of how their day went for us to quickly judge if yun lang talaga inatupag nila. And if yun nga lang, may masama nga ba dun? Hindi ba porket maganda ang photos hindi na nag enjoy and live the moment? But for me personally I want a balance when it comes to taking pictures when traveling + "enjoying the moment". I take inspiration from everything I see whenever I tour, lalo na sa streets of Seoul where everything's fresh in my eyes from street styles to cool store fronts to beautiful parks we don't have here. I can't let the moment pass by without snapping a "souvenir", and sometimes even practice my little photography skill since the subjects are just too pretty to just pass by! But I also had an experience of traveling with someone na photos lang talaga ang main intentions when traveling, and sometimes it gets soooobrang nakakainip for me. I want to see more and mag move on na sa next destination, but mali ba yung kasama ko? Hindi! Now I realized na maybe may mga ganun lang din talaga since we are all different people so we have different travel styles?? Kung may mga travellers who will prefer hotels, may mga travellers din who will prefer or can only afford budget accommodations. May chill lang and lounge in cafes pag nag ttravel, may gusto jam-packed ang day. May gustong long-term travel, may iba satisfied na for a few days or yun lang ang kaya for their leaves or budget. May travellers who are into city, and those who prefer nature and adventures. And may mga nag ttravel to just stroll around, and may nag ttravel din to take lots of photos to share! I guess, hanggang dito sa issue na ito to each his own padin? Walang mali at walang tama, respect lang for ano ang preferences ng individual person? 2) To share to your friends and family. I usually send updates on my family's FB groups whenever I travel solo by flooding them with my photos. My mom loves them. 3) To share travel tips online. For my blog, pictures make my travel posts more appealing. This is also subjective though! Kung wala namang tinatapakan or dinidisrespect or niloloko, then let them be! If that's enjoyable for them, then who am I to judge people who prefers traveling for the 'gram? Anyway, and so with that, let's move on to my Day 3 in South Korea... Or the day I traveled to beautiful DAEGU! I was extra nervous for this adventure, since I am used to Korea inter-city traveling via plane. When I went to Jeju and Busan, both were via JejuAir. Anyway, so I went to Seoul Station where the KTX line is located early in the morning. I pre-booked a discounted Korea Rail Pass (KR PASS) online before this trip, which gives me TWO rides with KTX. They have so many options via Klook, from 1-ride to unlimited rides, to 2-day flexible pass, to group passes. See this link to take your pick and see the prices! As for me, since my plan is to stay in Daegu for four days, and go back to Seoul for two more days before my flight back to Manila, I picked the Flexible 2-Day Pass which I used for Seoul to Daegu and then Daegu to Seoul. SOME TIPS WHEN YOU BOOK YOUR KTX PASS VIA KLOOK!!! 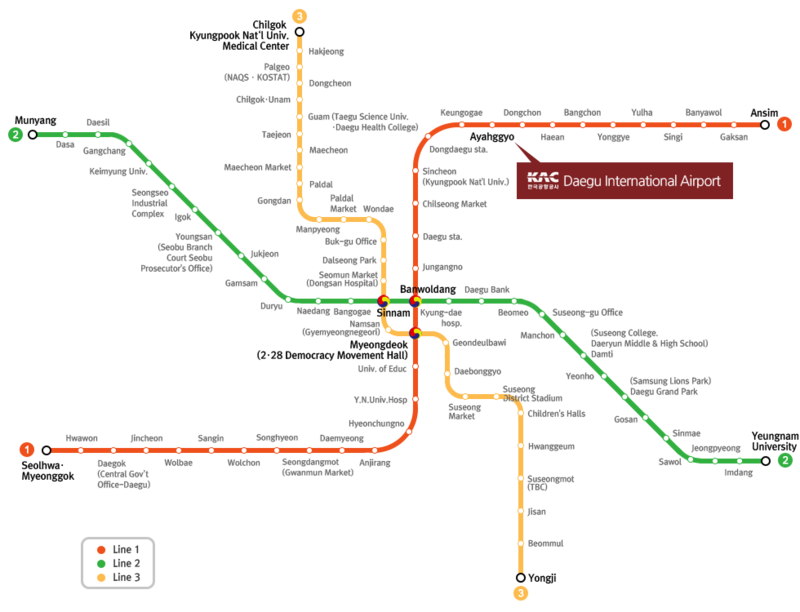 1) You can also use this not only for Daegu, but also for Busan and 600 other stations! You can check out Korail's website for the list. 2) Decide on your travel dates. Write them down, and show them upon claiming your actual tickets. 3) Some people were asking me if pwedeng day-trip lang ang Daegu, and I'd say OF COURSE! Choose the pass na pwedeng balikan like the 2-Day Flexi Pass. Plan your itinerary well so you can maximize your day. If you ask what's my favorite in Daegu, it's most prob E-World! There's also a nearby park in E-World named Duryu Park that you can also explore for your one-day tour. 4) If you can, pack light! Mas madali! BUT if you're like me who brings her whole house plus buys so much along the way (haha), then it's all good as long as you can carry your maleta while navigating. 5) When you get the confirmation from Klook via email, PRINT THE VOUCHER WHILE AT HOME OR AT YOUR GUEST HOUSE! One thing I did not realized was they are not so paperless here. Again, I am used to just showing my phone for my e-voucher, but in my experience here with KTX booked via Klook, they asked for a print out. This e-ticket that you need to print will be sent by Klook on your email upon payment. What I did was after asking around, I had to print out my ticket in a public printer using my credit card to operate the machine. Medyo kinabahan ako! No one's there to help me man the machine, I just figured it out on my own and bahala nalang, I just attached my credit card in the machine. It gave me time to use the internet to open my email and then print out my ticket. Show your print out at the information booth next to the business center. Both of these are located at the ground floor lang of Seoul Station. After showing your voucher, they will give you a CARD version of your KR Pass. After this, you go to the ticket booth (also on the same floor) to book your location and exact schedule (date and time) by showing your KR Pass. The person at the counter told me that when he inputs these details for the two days, hindi na pwede palitan so make sure to be extra OC with what you say or write! Check and double check if you must! I received TWO of this receipt type of paper. Keep them! These are your train tickets with the date, time of train's arrival, and also your seat number. I walked and asked and walked, pulling my luggage with me to the waiting area. There are huge black LED screens everywhere, flashing the trains arriving in 30 minutes or less. These boards will show which platform number you should head to. I waited in front of one of these, facing a huge stairs where passengers were also seated, waiting, eating, taking selfies. There are food booths in front so I made sure to stuff myself already, and had late lunch (very spicy veggie gyoza). When my train number was flashed on the screen, I hurried for the platform number. Even with a luggage, it's not so bad because they have escalators or elevators. Ang dami mo ding kasamang may maleta coz most of the passengers are locals heading home or for their own vacations. You can see the car number and seat numbers by the door of the train. Make sure you enter the correct car, and leave your luggage near the door. May lalagyan dun ng mga malalaking bags. Nakakatawa nung una tinabi ko talaga sakin yung maleta ko sa aisle, nakaka hiya hirap na hirap dumaan mga tao haha. Wala masyadong mag guguide sayo sa train so make sure to stay alert nalang. Kapa kapa nalang. Things went well naman for me, so all good! And after all the nitty gritty, I was finally able to breathe. Travel time from Seoul to Daegu by KTX is about 1 hours and 40 minutes. I slept a little, but tried to stay alert by opening my phone's Google Maps. Naka mark na dyan ang DAEGU para kahit hindi ko marinig yung sound system alam ko if nandun nako. One of the perks of using KTX vs planes is you can still use your internet during the whole 1.5 hours ride, haha! And also, when you already have your ticket, you don't have to check-in or be in the train station in advance! You can also bring heavy luggage coz walang weight limits! I was seated next to a military guy on the window seat, and two other military guys right across. I can't take my usual IG stories coz medyo nahiya naman ako. Walang food, but pwede mag baon at kumain. They have TV, but di ko na napansin anong pinapalabas. They also have a toilet on the train parang sa plane so hindi prob ang 1.5 hours. I strolled out of the main station for the local train. Again, wala akong research nito but I was able to get by just by looking at the signs. Before your trip, make sure to check the NEAREST SUBWAY STATION of your accommodation. There are also buses from Dongdaegu Terminal in case mas malapit sa accommodation mo is a bus stop but wasn't able to explore that na. I took the local train line, and was immediately amazed by how similar yet different it is from Seoul's. Mas onti ang train lines (they only have THREE), mas hindi ganun kadami ang tao, mas hindi nag mamadali, but still, the trains and train stations are very efficient, on time, and convenient. The station where I came from is DONGDAEGU (don't confuse this with Daegu Station like me, haha), which is also on the same RED line as my hostel's nearest subway station JUNGANGNO. I also used my T-Money Card that I loaded in Seoul for the Daegu trains and buses. It was love at first sight with Jungangno area. When I went out of the train, it was a beautiful city with ABC MART, CGV, Lotteria, and a whole lot of beauty and fashion shops. It looks like Myeongdong, but only less touristy! I am in love!! I saw this crowd right in front of this building everyday I was in Daegu. One time I passed by na talaga doon para mang usyoso hehe, and they were holding up photo cards! Was never really able to find out sino sina-stan nila, haha! The walk to my guest house is very convenient! I did not get lost, I just typed in the name of the hostel on my Google Maps and then followed it. I booked the CHEAPEST guest house that I found in Agoda, which is Go Hostel. Their price is only about Php 575 per night for a bunk bed in the female dormitory. The reception is on the 2nd floor, so prepare to go up the stairs with your luggage to check-in. Leave your shoes and pick a slipper. I chose the rubber type which I was able to use nadin pati sa pag shower. I paid in the hostel upon check-in, but reserved it online via Agoda. I was given a decent bed, a locker with my personal code, and a spacious room where I can freely open, get things, or fix my luggage without disturbing the person next to me. Photos of the female dorm. Malaki ang spacing here compared to my dorm experiences in Seoul. Hindi ka makakadistorbo sa kaluskos, and may couch pa nga sa gitna where some of my roomies hangout and eat strawberries! The toilet and shower room are both on the far end of our room. I made sure to choose the bed na malayo dito so I won't get disturbed by mga dumadaan lalo na pag sleeping time na (good decision!). I picked the lower bunk na open ang curtains, malaki space sa harap so minsan I just leave my open maleta there haha! But of course I fix my stuff whenever I go out. We all get a locker. My maleta doesn't fit so I just put it next to my bed, and ok lang because as mentioned earlier spacious ang room. Inside the locker, it fits my backpack where I placed all my shinopping and dirty clothes. The lady by the reception who also seems to own the place toured me around the guest house, and taught me the basic stuff like how to operate the hot-cold drinking water, where to get extra towels, how to use the lockers, lock the doors, etc. She's super friendly, and told me if I ever see myself back in Daegu she will personally tour me around and even give me free accommodation! I later on found out that she used to own a Kbeauty store in the Philippines, but she had to leave. She always greets me with Mabuhay! and Kamusta! I super love this place because of the people! I went out shortly to maximize my day 1 in Daegu! It was about 5pm already. I ate my leftover sandwich from breakfast while walking to the train. My hostel is just next to the Fashion Jewelry Town. An interesting building, but never went inside. I want to know your own thoughts on traveling for the 'gram! You can comment your thoughts below, or on my Instagram post @anagon. Akala ko nun una kong naisip iblog tong topic nato, I don't like traveling for Instagram. But then I realized, hindi ba yun din naman ginagawa ko? I'll be a hypocrite if I say don't travel to take photos and just live for the moment! Haha. Pwede namang balanse. Or pwede din namang DEPENDE sa tao at sa individual preferences. Hi Ana--just chiming in re: your question on travelling for IG. At the end of the day, it's really to each their own. People will follow you if they like your content, so I guess for professional Instagrammers (haha am sorry, I really cannot stand the term 'influencer') their follower stats speak for themselves. Personally, di ko type ung mga IG accounts na travel/lifestyle na bawat isang shot is nandun ung Instagrammer na sobrang posed. Personal preference lang talaga, mas gusto ko ung nakakakita ng breaks between shots na landscape lang, or street scene, ganon. Otherwise, it does not feel real, talagang collection lang ng vanity shots na ang pa-profound minsan ng caption, parang di naman ako naeengganyo pumunta dun sa lugar kahit plakadong-plakado ung picture. AGAIN, however, personal preference yon. Malay mo they have the last hurrah pala kasi they have all those great photos of theirs to look back on and reminisce about at the end di ba? Anyway, ang solusyon lang naman diyan is, follow the accounts which fit your taste. Thank you for this input Anna, and I have to agree to your points haha!! Minsan ako nga mismo nauumay na sa sarili ko hahaha. My friends and I even have a term for this, "Panay Me ME ME ba?" so inaalternate nalang ang posting, lels. But agree, mamaya pabor din sa iba yan na panay portraits nila coz ang dami nilang pics at that moment in their life! <3 Anyway thank you again for sharing & for your honesty... much appreciated! Just to share--There's actually this Instagrammer who I used to follow, ang galing kasi talaga ng photog and editing skills niya, grabe. Kaso haha napansin ko sunod sunod na mukha lang niya ung nakikita ko, nakakainis pala kahit ang ganda nung pictures and nung location. Eh sino ang mag-a-adjust? Malamang ako, di ba, alangan namang siya eh may mga tao naman na gusto yung ganon (dami kaya niyang followers). For some people kasi I guess it can be aspirational? Like, maybe those kinds of Instagrammers help other people imagine themselves being in the exact same place and taking the exact same shot, e di naka-inspire ka pa. So wala talagang mali don. Actually ang mas nakaka-agit for me is ung mga pa-profound talaga na caption haha pero again, di naman ako ang target market/audience nila, pakialam ba nila sa preferences ko hahaha. So para di na lang ako magkasala sa pagiging judgmental, e di pili lang talaga ung fina-follow ko sa IG. Win-win for everyone, right?